As people strive to pull the perfect balancing act between impossible work schedules and demanding personal commitments, their health often goes for a toss. In fact, “health is wealth” has become more of a trite old saying that people like to pass around but have no intention of sticking by. It is on account of the whirlwind times that we live in where every little action is a race against time, that calorie-laden junk food and takeouts consumed on the go have increasingly replaced the traditional home-cooked meals. Moreover, after spending the whole day tied to our work desk, burning away the surplus calories accumulated over the day figures very low on your list of priorities. A direct implication of such unhealthy dietary and lifestyle patterns is that obesity has emerged as a pressing issue afflicting the well-being of people around the world. 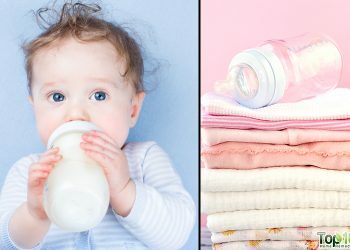 The Centers for Disease Control and Prevention (CDC) throws light on the gravity of this problem by stating that in America alone, about 93 million adults and 18 percent of American children and teenagers fall under this category. Despite the obvious functional and cosmetic challenges that come with being overweight or obese, it also serves as a precursor to a number of other serious ailments, such as type 2 diabetes, heart disease, and cancer. As obesity typically results from an unhealthy diet and lack of adequate exercise, following a well-balanced diet and regular physical activity are perhaps the two best tools for shedding the flab. Because it takes much longer to lose weight than it takes to put it on, reaching your ideal number on the weighing scale is going to be a long and arduous job. You can thus do it with a little bit of extra help along the way. One ingenious adjunctive trick to complement and possibly enhance your weight loss program is to slurp on a steaming cup of herbal tea. When it comes to variety, you are spoilt for choice with supermarkets lined with a wide array of herbal tea options. A few cups will help assist your weight loss regimen – that is, calorically control along with adequate exercise – by boosting your metabolism to help you burn fat easily and rapidly. Tea even reduces bad cholesterol levels and can actually help you shrink fat cells. Tea also aids in losing weight by keeping your appetite in check, so that you don’t indulge in mindless eating, as well as supports the liver and kidneys in carrying out the detoxification process to flush toxins out of the body. Apart from weight management, herbal teas can also help improve digestion, boost energy, and help prevent arthritis, tooth decay, and cancer. All it takes is your preferred tea leaves or bags and some hot water to whip up this health-promoting tonic. Just another reason to give herbal teas a go! 1. Herbal tea is a derivative form of real tea. 2. All varieties of herbal teas contain zero caffeine. 3. The natural goodness of herbal teas helps improve your health sans any side effects. 4. There is no limit to how much herbal tea you can consume. 5. Herbal teas contain only a singular herb that is mentioned on the tea packaging. 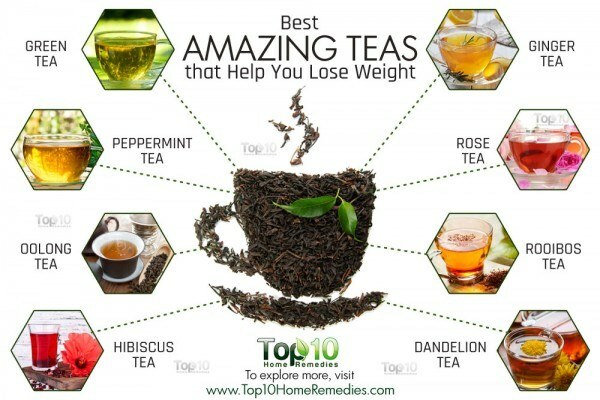 Here are the top 10 amazing teas that help you lose weight. When it comes to the best tea for weight loss, green tea surely tops the list. It contains the catechin epigallocatechin gallate (EGCG), a naturally occurring antioxidant that, along with caffeine, boosts metabolism to burn calories and promotes speedy weight loss. This catechin helps to unlock the fat cells by targeting the adipose tissue, particularly in the belly. The fat released by the cells is then utilized by the liver for energy, and the catechins help enhance the liver’s ability to do so. Green tea also raises the level of antioxidants in the body. Plus, regular intake of green tea supports detoxification. A 2014 study conducted at Penn State showed that the EGCG in green tea helps slow down weight gain by limiting fat absorption and increasing the body’s ability to use fat. Furthermore, the positive effects of green tea on weight loss and weight maintenance were previously expounded upon in a 2009 study published in the International Journal of Obesity. Put 1 to 2 teaspoons of good-quality green tea leaves in a cup. Excessive consumption of green tea (more than 3 cups a day) for a prolonged period is considered unsafe and can even prove fatal. Refrain from consuming green tea if you have liver problems or are taking stimulant drugs such as amphetamines, cocaine, and ephedrine. Take green tea with necessary precaution if you happen to suffer from anxiety or bleeding disorder, heart trouble, high blood pressure, glaucoma, irritable bowel syndrome, or weak bones. Given that peppermint works as a natural appetite suppressant, tea made from fresh or dried peppermint leaves can help support your weight loss efforts. To optimize this benefit, drinking a cup of peppermint tea between meals can prove useful in reducing hunger pangs. This, in turn, prevents overeating and helps you stay off calorie-rich snacks. Moreover, peppermint tea has minimal calories itself and thus can be consumed without the fear of unnecessary weight gain. The herb also engenders a soothing effect on your digestive system and reduces your stress levels. Elevated stress levels have been found to hamper metabolism rate and therefore can prove detrimental to your weight loss regimen. Add 1 tablespoon of either fresh or dried peppermint leaves to 1 cup of boiling water. Strain the tea, add a little bit of raw honey, and stir well before drinking. Drink this tea not more than 3 times a day. Peppermint tea is not recommended for women who are trying to conceive or are pregnant or breastfeeding. Occasionally, it may cause GERD or interact with over-the-counter prescription drugs. Like green tea, oolong tea also comes packed with catechins, which help your body metabolize fat faster. This mild floral tea even helps reduce cholesterol and the concentration of fat in the body. A study published in the Chinese Journal of Integrative Medicine highlights the beneficial effects of oolong tea consumption on diet-induced overweight and obese subjects as it could decrease body fat content and reduce body weight by more than 1 kg through improving lipid (fat) metabolism. A study showed that intake of oolong tea stimulates both energy expenditure (2.9–3.4 percent) and fat oxidation (12 percent) in average-weighing men. Bring 1 cup of water to a boil, and then allow it to rest for 2 minutes. Pour the water into a pot or cup. Add 1 to 2 teaspoons of oolong tea leaves to the water. Cover and steep for 1 to 5 minutes. Drink 2 cups of this tea daily. Used tea leaves can be steeped a couple more times, producing new flavors with each subsequent brew. Drinking a high amount of oolong tea (more than 2–3 cups in a day) is unsafe due to its caffeine content. This tea should only be consumed in moderation, especially if you are pregnant, breastfeeding, or suffering from heart disease, irritable bowel syndrome, diarrhea, etc. Consumption of oolong tea should be completely avoided if you are on stimulant drugs. White tea is one of the teas highly rich in antioxidants that prevent new fat cells from forming. It even slows down the body’s ability to absorb fats. The caffeine in it also speeds up the metabolism process. A 2009 study published in Nutrition and Metabolism reports that white tea extracts can effectively block adipogenesis (the formation of fat cells) and boost lipolysis (the breakdown of fat). These, in turn, fight obesity and reduce the risk of obesity-related diseases. This delicately flavored tea with a tinge of sweetness also works as a natural appetite suppressant, thus helping you cut down on unnecessary snacking. The natural method of drying white tea, usually in sunlight, saves up on the inherent antioxidants that are often stripped away during the processing of teas. Thus, white tea figures as the richest source of antioxidants among teas, with three times the polyphenols found in green tea. Put 1 tablespoon of loose white tea leaves into a cup. Pour in hot water up to ¾ inch of the rim of the cup. Steep for about 5 to 7 minutes. The tea may take longer to brew (about 10 minutes) if it consists of buds only. Strain, add lemon juice or a little mint for flavor and drink it. You can drink 2 to 3 cups of white tea a day. This tea is naturally sweet, so there is no need to add any sweetener. The beautiful hibiscus flower, when brewed into tea, is an excellent beverage for weight loss. It contains high concentrations of antioxidants that aid in weight loss by boosting metabolism. The enzyme inhibitor called phaseolamin present in it reduces the production of amylase, which in turn allows fewer carbohydrates to be absorbed into your bloodstream, thereby accelerating weight loss. Plus, hibiscus tea is diuretic in nature, which means that its consumption induces more frequent urination. 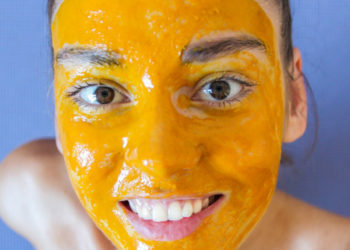 This attribute is particularly helpful for shedding undesired water weight. In a study, researchers found that people who took tablets made from hibiscus extracts for 12 weeks showed reduced waist circumference, body fat percentage, and hip-to-waist ratio when compared with obese people who took a placebo. Bring it to a boil, and then simmer for 5 to 10 minutes. Strain and add a little raw honey and a little lemon juice to make it extra flavorsome. However, it’s best to do without honey as it comes with its own fair share of calories. Note: If you are a pregnant or nursing, do not drink hibiscus tea. Ginger tea is also effective in promoting weight loss. It promotes satiety, which prevents unnecessary snacking and compulsive eating of high-calorie foods. This makes it easy for you to cut back on your daily calorie intake. In addition, ginger improves digestion and boosts your metabolism and may assist with managing nausea. A 2014 study published in the Journal of the Science and Food of Agriculture notes that gingerol, the primary compound in ginger, helps reduce body weight while simultaneously improving the levels of leptin, the hormone that signals satiety. Moreover, a study suggests that following a meal with a hot ginger beverage helps ward off hunger pangs for up to 6 hours. Cut 1 inch of fresh ginger root into small pieces and add them to 1½ cups of boiling water. Strain, add the juice of half a lemon and sip the tea slowly. Drink 2 to 3 cups of ginger tea a day. 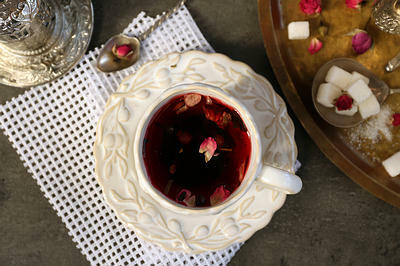 Rose tea is another aromatic tea variant that is highly effective in bolstering your concerted efforts to lose some pounds. It has an abundant supply of antioxidants that boost metabolism and support the liver and kidneys in cleansing the body of toxins. It even helps curb sugar cravings, one of the main reasons behind weight gain. Plus, it is low in calories. Add 2 cups of fresh rose petals (thoroughly washed under running water) to a pot containing 3 cups of water. Simmer the water on low to medium heat for 5 to 10 minutes, and then strain. If desired, sweeten the tea with some raw honey. However, drinking it plain without the extra calories that come with honey is likely to get you better and faster results. Note: Always use rose petals that have not been treated with pesticides. Rooibos tea is good at keeping your figure slim. It is rich in the powerful flavonoid aspalathin, which helps reduce stress. Stress is often linked to hunger pangs and excess fat storage in the body. The tea even protects the body from free radicals and promotes weight loss. Plus, it is low in calories and naturally sweet, so you do not have to add any sweetener. This tea even reduces the risk of heart disease, premature aging, and other serious conditions. Try to drink no more than 3 cups of rooibos tea a day. 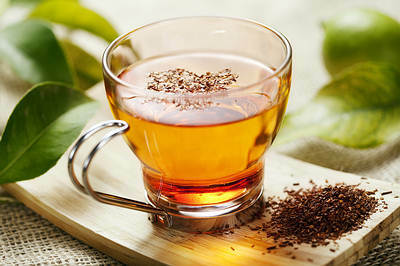 Put 1½ teaspoons of loose rooibos tea leaves in a cup. Cover and steep for 5 to 7 minutes. Strain and drink the tea while it is still warm. Note: Cancer patients going through chemotherapy should not drink this tea. Plus, due to its estrogenic activity, this tea may not be suitable for people suffering from hormone-sensitive conditions. 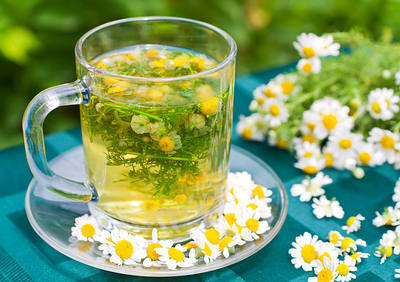 Chamomile tea helps dispel fatigue and depression by reducing the stress stemming from insufficient sleep or insomnia. This dip in stress levels helps prevent the subsequent increase in bodily inflammation, which has been directly tied to weight and blood sugar disorders such as obesity and diabetes. This herb is also known for its detoxification and diuretic qualities and thus helps rid your body of waste and excess water. Plus, it helps curb your appetite by promoting satiety, which in turn helps curb unnecessary munching on high-calorie snacks. It’s found that drinking a cup of tea made of bitter herbs, such as chamomile, gentian, or dandelion root before each meal stimulates the production of gastric juices, which in turn promotes weight loss. For best results, drink 1 cup chamomile tea right before a meal. Cover and steep for 5 minutes, and then strain it. Add a little raw honey and drink the tea while it is still warm. 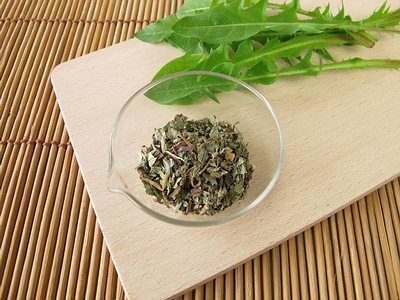 Dandelion tea is another good choice for people who wish to shed some pounds. It has diuretic properties that help you get rid of your water weight. A 2009 study published in the Journal of Alternative and Complementary Medicine highlights that dandelion extract increases urination output for 5 hours after consumption. The consumption of this tea might help you shed your water weight but has been found largely ineffective against fat. 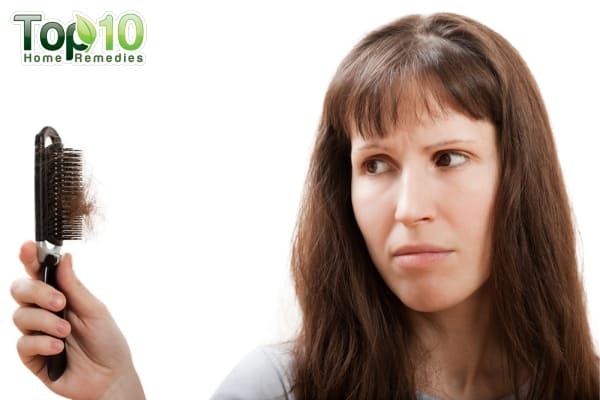 Put 1 to 2 teaspoons of dried dandelion root (chopped) in a saucepan. Add 2 cups of water and boil it for 5 to 10 minutes. Strain and drink this tea 2 or 3 times a day. You can also make the tea using dandelion tea bags. Many herbal teas like peppermint, chamomile, and green tea can potentially interact with several drugs, particularly blood-thinning drugs such as warfarin. It’s always recommended to consult a doctor before including these teas in your routine if you are taking prescription or over-the-counter medicines to avoid serious complications such as internal bleeding. From the looks of it, it’s hard to tell that herbal tea and real tea are apart. But that doesn’t change the fact that the two are essentially different categories. Real teas can be traced back to the tea plant Camellia sinensis, whereas herbal teas are derived by infusing herbs, namely, dried or fresh leaves, flowers, grasses, barks, roots, seeds, and fruits. The method of preparation for both is, however, the same, which entails pouring hot water over your mug constituents, which can either be herbs or tea leaves. This begs the question, why not consider herbal tea just as authentic as the conventional varieties? Especially because it’s not entirely uncommon to blend herbs with tea leaves in your brew. Because herbal teas are usually without any caffeine, you can drink them without worrying if you will stay up all night. While this may be true for most varieties, it doesn’t apply to guarana tea and yerba mate tea, which do contain caffeine. In fact, yerba mate boasts a caffeine percentage that is on par with that of coffee! Without undermining the health potential of herbal teas, you will do well to remember that not all of them are completely devoid of any side effects. For instance, certain varieties can trigger allergic reactions that entail shortness of breath, chest pain, hives, and swelling. Other herbal teas may even adversely interact with your ongoing medication. This means that consumption of these teas can diminish or dangerously enhance the effects of your meds and, therefore, should only be consumed medicinally after getting clearance from your doctor. The fact that most herbal teas are caffeine-free doesn’t give you the license to consume them in an unchecked manner with the aim to reach your health goals faster. As they say, too much of a good thing can be bad, and the same stands true for herbal teas. Excessive consumption can be counter-intuitive and can bring in its wake a number of unwanted side effects. Hibiscus tea, for instance, is touted for its effectiveness in lowering blood pressure, but overindulgent intake can plunge your blood pressure to dangerous lows and can cause faintness and drowsiness! Don’t be fooled by the packaging of your favorite brand of herbal tea, and take a closer look at the ingredient list to get a clear picture of what goes into making your preferred blend. It is a marketing gimmick employed by many tea brands to highlight a singular herb while promoting a tea blend for particular health issues – for example, chamomile as a soothing tea and ginger as a digestive tea. This is done to lure more customers by advertising a herb that is commonly considered as a healing agent for the specific problem. However, more often than not, this primary herb is mixed with other herbs for flavor and enhanced benefits. Thus, it is essential for you to go through the labels closely to rule out any herbs that might be harmful to your particular health profile as well as to properly assess if you are getting the real thing or just a flavoring agent added to your tea. Overweight & Obesity. Centers for Disease Control and Prevention. https://www.cdc.gov/obesity/data/adult.html. Published August 13, 2018. Obesity and overweight. World Health Organization. https://www.who.int/en/news-room/fact-sheets/detail/obesity-and-overweight. Maron DJ. Cholesterol-Lowering Effect of a Theaflavin-Enriched Green Tea Extract. JAMA. https://jamanetwork.com/journals/jamainternalmedicine/fullarticle/215752. Published June 23, 2003. Koithan M. Using Herbal Remedies to Maintain Optimal Weight. The Journal for Nurse Practitioners. https://www.ncbi.nlm.nih.gov/pmc/articles/PMC2927017/. Published February 2010. Mohamed GA, Ibrahim SRM, Dine RSE. Natural anti-obesity agents. Bulletin of Faculty of Pharmacy, Cairo University. https://www.sciencedirect.com/science/article/pii/S1110093114000179. Published June 14, 2014. Alghadir AH, Gabr SA, Eisa ESA-. Green tea and exercise interventions as nondrug remedies in geriatric patients with rheumatoid arthritis. Journal of Physical Therapy Science. https://www.ncbi.nlm.nih.gov/pmc/articles/PMC5088134/. Published October 28, 2016. Research suggests that green tea, exercise boost weight loss, health. Penn State University. https://news.psu.edu/story/310179/2014/04/02/research/research-suggests-green-tea-exercise-boost-weight-loss-health. Published April 2, 2014. Full Report (All Nutrients): 45106863, PEPPERMINT HERBAL TEA, UPC: 036800087071 . 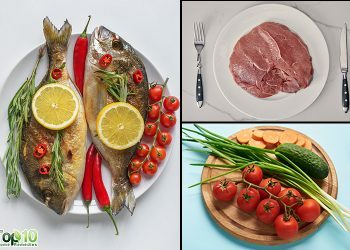 USDA Food Composition Databases. https://ndb.nal.usda.gov/ndb/foods/show/45106863. Published April 2018. He RR, Chen L, Lin BH, Matsui Y, Yao XS, Kurihara H. Beneficial effects of oolong tea consumption on diet-induced overweight and obese subjects. Chinese Journal of Integrative medicine. https://www.ncbi.nlm.nih.gov/pubmed/19271168. Published February 2009. William R, Seale J, Judd J. Oolong Tea Increases Metabolic Rate and Fat Oxidation in Men. The Journal of Nutrition. https://academic.oup.com/jn/article/131/11/2848/4686734. Published November 1, 2001. Söhle J, Knott A, Holtzmann U. White Tea extract induces lipolytic activity and inhibits adipogenesis in human subcutaneous (pre)-adipocytes. Nutrition & Metabolism. 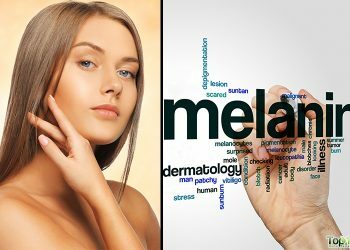 https://nutritionandmetabolism.biomedcentral.com/articles/10.1186/1743-7075-6-20. Published May 1, 2009. Villalpando-Arteaga EV, Mendieta-Condado E, Esquivel-Solís H, et al. Hibiscus sabdariffa L. aqueous extract attenuates hepatic steatosis through down-regulation of PPAR-γ and SREBP-1c in diet-induced obese mice. Food & Function. https://pubs.rsc.org/en/content/articlelanding/2013/fo/c3fo30270a. Published February 7, 2013. Saravanan G, Ponmurugan P, Deepa MA, Senthilkumar B. Anti‐obesity action of gingerol: effect on lipid profile, insulin, leptin, amylase, and lipase in obese male rats induced by a high‐fat diet. Journal of the Science of Food and Agriculture. https://onlinelibrary.wiley.com/doi/abs/10.1002/jsfa.6642. Published March 10, 2014. Mansour MS, Ni Y- M, Roberts AL. Ginger consumption enhances the thermic effect of food and promotes feelings of satiety without affecting metabolic and hormonal parameters in overweight men: A pilot study. Plum X Metrix. https://www.metabolismjournal.com/article/S0026-0495(12)00118-7/abstract. Published October 2012. Vinokur Y, Rodov V, Reznick N, et al. Rose Petal Tea as an Antioxidant‐rich Beverage: Cultivar Effects. Journal of Food Science. https://onlinelibrary.wiley.com/doi/abs/10.1111/j.1365-2621.2006.tb12404.x. Published May 31, 2006. Hong I- S, Lee H- Y, Kim H- P. Anti-Oxidative Effects of Rooibos Tea (Aspalathus linearis) on Immobilization-Induced Oxidative Stress in Rat Brain. PLoS One. https://www.ncbi.nlm.nih.gov/pmc/articles/PMC3897768/. Published January 21, 2014. Scott KA, Melhorn SJ, Sakai RR. Effects of Chronic Social Stress on Obesity. Current Obesity Reports. https://www.ncbi.nlm.nih.gov/pmc/articles/PMC3428710/. Published March 2012. Srivastava JK, Shankar E. Chamomile: A herbal medicine of the past with bright future. Molecular Medicine Reports. https://www.ncbi.nlm.nih.gov/pmc/articles/PMC2995283/. Published November 1, 2010. Clare BA, Conroy RS, Spelman K. The diuretic effect in human subjects of an extract of Taraxacum officinale folium over a single day. The Journal of Alternative and Complementary Medicine. https://www.ncbi.nlm.nih.gov/pubmed/19678785. Published August 2009.